Kyle P. Allen MD MPH is an Otologist, Neurotologist, and Skull Based Surgeon in Tampa, FL. 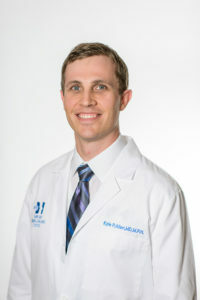 Kyle P. Allen MD MPH graduated in 2006 from Tulane University School of Medicine. He was elected a member of the Alpha Omega Alpha Medical Honor Society, a national organization of outstanding medical school students. Dr. Allen completed post-graduate residency training in Otolaryngology – Head and Neck Surgery at the University of Texas Southwestern Medical Center, Dallas, TX. He is Board Certified by the American Board of Otolaryngology. He completes his two-year fellowship in otology, neurotology and skull-base surgery June 2013 at the the University of Texas Southwestern Medical Center, Dallas, TX. Dr. Allen joins the Tampa Bay Hearing and Balance Center July 2013. Kutz JW, Mitchell D, Isaacson B, Roland PS, Allen KP, Sumer BD, Barnett S, Truelson JM, Myers LL. En Bloc Resection of the Temporal Bone and Temporomandibular Joint for Advanced Temporal Bone Carcinoma. Otolaryngol Head Neck Surg. 2015 Mar;152(3):571-3. Allen KP, Bartels LJ, Isaacson B. Cochlear Implantation Requiring a Retrofacial Approach to the Round Window. Otology & Neurotology. Otology & Neurotology. 2015 Mar;36(3):e84-6. Kou YF, Allen KP, Isaacson B. Recurrent meningitis secondary to a petrous apex meningocele. American Journal of Otolaryngology, 2014 May-Jun;35(3):405-7. Allen KP, Hatanpaa KJ, Lemeshev Y, Isaacson B, Kutz JW. Intratemporal Traumatic Neuromas of the Facial Nerve: Evidence for Multiple Etiologies. Otology & Neurotology. 2014 Feb;35(2):e69-72. Allen KP, Perez CL, Kutz JW, Gerecci D, Roland PS, Isaacson B. Elevated Intracranial Pressure in Patients with Spontaneous Cerebrospinal Fluid Otorrhea. Laryngoscope. 2014 Jan;124(1):251-4. Allen KP, Roland PS. Bilateral Fallopian Canal Arachnoid Cysts in a Patient with Spontaneous Cerebrospinal Fluid Otorrhea. Otology & Neurotology. 2013 Dec;34(9):e128-9. Jiang ZY, Allen K, Kutz JW, Isaacson B. Clinical Impact of Early CT Scans after Lateral Skull-Base Surgery. Otolaryngology Head and Neck Surgery 2013 Nov;149(5):786-8. Allen KP, Isaacson B, Kutz JW, Purcell PL, Roland PS. The association of meningitis with postoperative cerebrospinal fluid fistula. Journal of Neurological Surgery B 2012; 73(06): 401-404. Allen KP, Roland PS. Bilateral Fallopian Canal Arachnoid Cysts in a Patient with Spontaneous Cerebrospinal Fluid Otorrhea. Otology & Neurotology. Accepted for publication. Allen KP, Isaacson B, Purcell P, Kutz JW, Roland PS. The Association of Meningitis with Post-Operative Cerebrospinal Fluid Fistula. Journal of Neurological Surgery – Part B. Accepted for publication. Allen KP, Perez CL, Isaacson B, Roland PS, Duong TT, Kutz JW. Superior semicircular canal dehiscence in patients with spontaneous cerebrospinal fluid otorrhea. Otolaryngol Head Neck Surg. 2012 Dec;147(6):1120-4. Allen KP, Isaacson B, Purcell P, Kutz JW, Roland PS. Lumbar subarachnoid drainage in cerebrospinal fluids leaks after lateral skull base surgery. Otology & Neurotology. 2011 Dec;32(9):1522-1524. Allen K, Ulualp SO, Veltcamp D. Radiology case quiz: Pilomatrixoma. Archives of Otolaryngology Head and Neck Surgery. 2011 May;137(5):523, 525. Allen KP, Roland PS. The Anatomy of the Auditory System. In: Atlas of Oral and Maxillofacial Surgery. Kademani/Tiwana (Eds). Elselvier Publishing. Publication pending. “Meniere’s Disease” Lakeland Hearing Loss Association, Hearing Wellness Expo. Lakeland, FL. February 21, 2015. “Understanding Balance Disorders” Lakeland Hearing Loss Association, Hearing Wellness Expo. Lakeland, FL. February 21, 2015. “Cochlear Implants: Current Trends and Availability” Sarasota Hearing Loss Association. Sarasota, FL. January 14, 2015. “Hearing Conservation in Cochlear Implantation” Update in Otology. CME Presentation for local physicians. Tampa, FL. November 6, 2014. “Latest Solutions for Hearing Loss” Community Presentation. Sun City Center, FL. November 5, 2014. “Understanding Balance Disorders” Tampa General Hospital Community Health Education. June 10, 2014. “Single-Sided Deafness” Lakeland Hearing Loss Association, Hearing Wellness Expo. Lakeland, FL. May 31, 2014. “Sudden Sensorineural Hearing Loss” Update in Otology. CME Presentation for local physicians. Clearwater, FL. December 3, 2013. “Understanding Balance Disorders” Tampa General Hospital Community Health Education. October 24, 2015. “Sudden Sensorineural Hearing Loss” Update in Otology. CME Presentation for local physicians. Tampa, FL. October 15, 2013. “Spontaneous Cerebrospinal Fluid Otorrhea” Otology Update. CME Presentation for local physicians. Lakeland, FL. January 2013.